Nothing tastes better on a hot summer day than a cold glass of water. But, a cold glass of watermelon detox water can actually do much more for your body than a cold glass of traditional water. Detox drinks contain additional fruits and vegetables which offers additional healthy ingredients that can contribute to a healthier lifestyle. These ingredients can also rejuvenate your skin, improve your mood, contribute to weight loss and usually leave you feeling more healthy overall. Follow the simple watermelon detox water recipe below to quickly make your own healthy detox water that can be consumed after a workout, around the house, at work, or any other time! 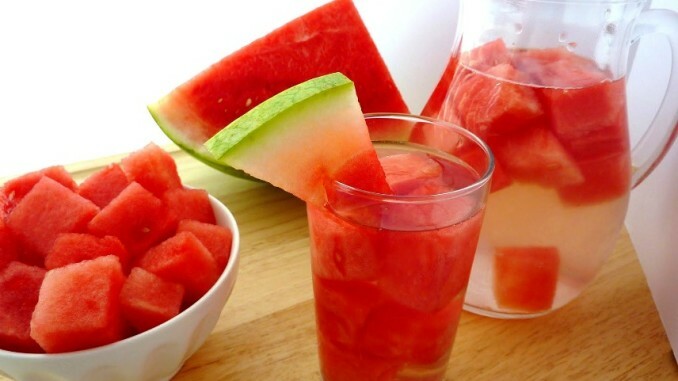 1) Place Watermelon in pitcher and cover with Water. 2) Place pitcher of water into the refrigerator for a few hours before drinking – this lets the water soak in watermelon for more flavor. It’s recommended that you try to drink at least six glasses of water each day. The slightly sweet taste is not just great for summer afternoons, but really anytime of the year. If you enjoy the taste of watermelon in other foods or beverages then you will are certainly going to be coming back for seconds with this one. 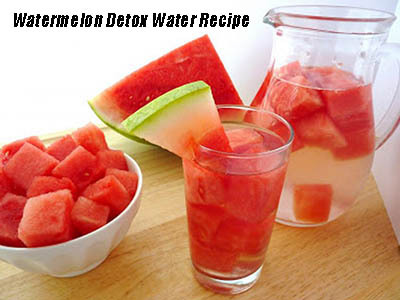 Try out this recipe to see just how good watermelon detox water can really be!